We’re in a nondescript training room in a downmarket Sydney building, kneeling around manikins with no lower bodies. We pump the dummies’ chests vigorously, stopping every 20 seconds or so to puff a couple of breaths between their plastic lips. Our partners cut in, earnestly attaching defibrillator pads to bloodless torsos. We’re practising skills most of us will never use. But for those of us who do, it can be life-changing — as I can attest. A couple of years ago, I was that dummy. I was driving home from my morning swim when I suddenly went offline. A knot of chemicals in a central blood vessel — one of the logjams obstructing four of my coronary arteries, it turned out — had stopped blood flowing and tripped a fuse in my heart. I was in cardiac arrest, a state technically known as “deceased”. But I lucked out. Some nearby angels took interest in the guy parked on the footpath, slumped in the driver’s seat and apparently gasping for air — a reflex action bystanders often mistake for breathing. A small crowd formed, attracting the attention of a passing ex-paramedic called Anthony Evans, who has form as a freelance lifesaver. He performed cardiopulmonary resuscitation, a primitive procedure that involves pressing on the sternum to pump the heart manually, so that blood — and its vital cargo of oxygen — keeps circulating around the body. He did it so expertly that in the 12 minutes or so that it took for the ambulance to arrive, hook me up to its Packer whacker and zap me a few times, I lost no brain cells — or none that I’ve noticed, at any rate. Now I’m here, hoping I can do likewise if I ever find myself in his position. Of the 17 students in the room, I’m the only who hasn’t done this course before and one of just three men. Most are health or care professionals doing yearly refresher training to recertify for work. Aside from our instructor, a St John Ambulance veteran called Karen Schneider, only one of us has performed CPR for real. It was years ago when she was a uni student with a part-time job at a gym, and a young man with a pre-existing medical condition collapsed on a treadmill. Cardiovascular disease is our biggest killer, with heart attacks striking Australians every 10 minutes or so on average. Yet, curiously, few of us encounter these emergencies. Martin Thomas, St John’s training and development manager, says he has never witnessed a cardiac arrest. And he has barely met any survivors. This is a little easier to understand, given that only about 12 per cent of Australians who have cardiac arrests outside hospital live to tell the tale. The young man in the gym, for example, could not be revived even after the ambos arrived with a defibrillator and adrenalin shots. When I came to in hospital a couple of years ago, I almost had rock-star status. Staff came to gawk at me as if I were Lazarus. “You’re so lucky,” they told me. More people should be so lucky. And they could be. In Seattle, a sort of CPR utopia, about 65 per cent of people survive out-of-hospital cardiac arrests thanks to ubiquitous defibrillator machines and widespread training. But we’ll still need people who know CPR, which — as well as keeping blood circulating — gives the heart the faint electrical rhythm that defibrillators supply to shock it into full function. If reviving dummies feels fake, the exercises where fellow students pretend to be unconscious are awkwardly intimate. We confirm that our partners are breathing, roll them into the recovery position and check them for obvious injuries. The mechanics of it are straightforward, but the personal dimension is challenging. This is magnified in real life, when resuscitators must deal not only with victims but panicking family and meddling strangers. 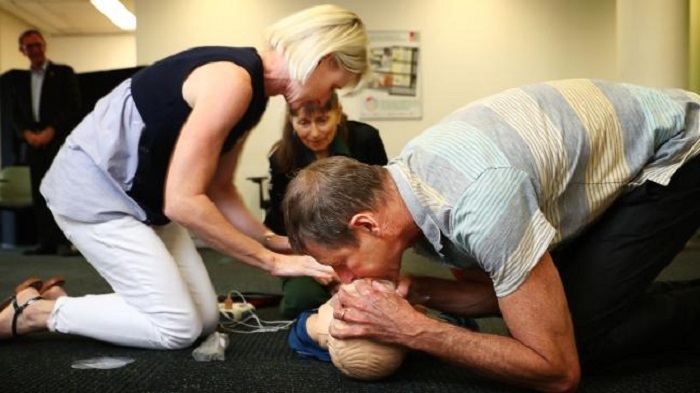 Doing CPR well is a masterclass in people management. “When you have to do it, you’ve got one thing working in your favour, and that’s adrenalin,” Thomas says. Schneider addresses other reservations that keep people from intervening. “Good Samaritan” legislation shields people from liability if they act in good faith and do not overstep their training or instructions from emergency services. And while unconscious people can’t verbally agree to be revived, their consent in such a situation is implied. Schneider stresses that no one is obliged to perform CPR. And she says no one will blame them if it doesn’t work. On the contrary, family members will be heartened to know the victim’s final ­moments were not spent alone. Retired nurse Gemma McCormack has her mind on people at the other end of the age spectrum. “I do a bit of unofficial babysitting for old people,” she explains. I’m somewhere between those two extremes. But if Evans hadn’t performed his magic that June morning, my mother would have outlived a child. My partner would be bereaved and my three kids would be growing up without a dad. My alternative universe, in which I no longer exist, doesn’t bear thinking about.